Government agencies, public health organisations and the private sector are increasingly funding campaigns to encourage participation in sport. These campaigns frequently achieve moderate levels of success,1 yet many of the individuals who heed these calls to action may be ill prepared for the physical rigours of sport, especially when campaigns do not address how to participate in sport safely. This is not an idle concern; individuals with limited experience in their sport of choice are at increased risk of developing a sports injury, as are those who have recently returned to sport after a prolonged absence.2 Public health campaigns aimed at encouraging sport participation should therefore take into account the findings from the sports injury prevention literature so that those who adopt the campaign messages will be less susceptible to experiencing sports injuries. One approach that could be used to transfer the learnings from the sports injury prevention literature to the broader population is social marketing. Social marketing refers to ‘the adaptation of commercial marketing technologies to programs designed to influence the voluntary behaviour of target audiences to improve their personal welfare and that of the society of which they are a part’.3 While it has been recommended as a strategy to prevent road accidents and trauma for some time,4 social marketing has not yet been widely applied to sports injury prevention. Unfortunately, the term ‘social marketing’ is often applied indiscriminately to a range of mass media and health-promotion campaigns, obscuring both the nature and content of this method of behaviour change. As such, it is particularly important to appreciate the central features of the social marketing process (figure 1), and to understand how this process could be applied within the sports injury prevention discipline. 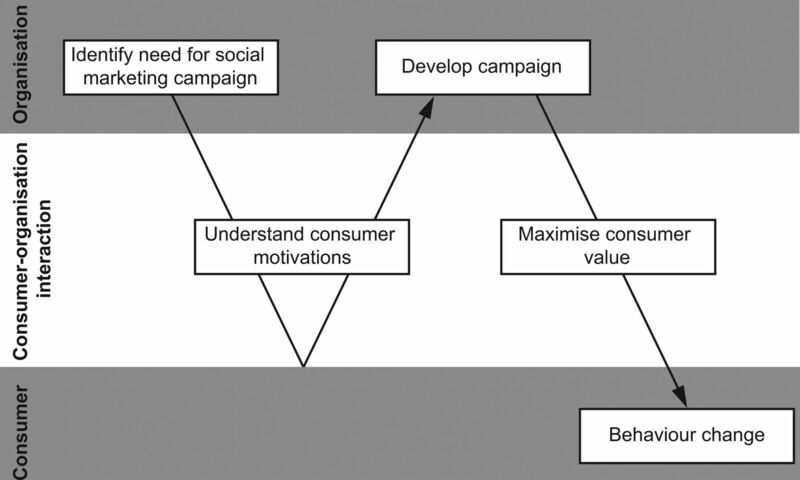 One of the defining characteristics of social marketing campaigns is their focus on the exchange process.5 In exchange theory, consumers are perceived to be self-interested actors who are motivated to seek the largest personal benefit for the smallest personal cost.6 Exchange theory may initially appear more relevant to commercial marketing campaigns, where consumers compare the benefits associated with particular goods or services against their price. Nevertheless, those tasked with increasing safer sport participation may also benefit from adopting an exchange-theory mindset, for participants are unlikely to adopt safer sports behaviours if they perceive that the benefits arising from these behaviours are small, diffuse or costly.7 Thus, sports participation programmes should provide benefits that injury prevention experts and participants perceive to be of value.6 Indeed, according to Andreasen's SESDED framework,8 social marketing campaigns should offer participants a Superior Exchange that is Socially Desirable and Easily Done. This may entail changing policies or modifying the environment in addition to more typical intervention methods such as providing information or education. A recent sports injury prevention programme aimed at increasing helmet use among skiers and snowboarders at Colorado ski resorts exemplifies how social marketing can be used to motivate behaviour change.9 At the time of the campaign, patrons attending Colorado ski resorts did not consider helmets to be an essential item of equipment because they were not included in standard hire packages.10 Moreover, helmet use was not widely accepted.10 The sports injury prevention programme therefore applied several social marketing principles to encourage helmet use.9 First, the programme provided consumers with an attractive exchange by reducing the fiscal, temporal and social costs associated with wearing a helmet. For instance, free helmet loans were offered with standard ski or snowboard hire packages through a popular rental firm to reduce the effort and monetary costs of organising helmet hire. Moreover, a public relations campaign was conducted through national, local and specialist media to highlight the dangers associated with snowboarding or skiing without wearing a helmet. Second, segmentation was used to specifically target snowboard and ski instructors, for these individuals were identified as opinion leaders that could influence the behaviour of others. To this end, instructors were given helmets to wear free of charge. The programme was ultimately successful in its aim of increasing helmet use.9 The percentage of consumers who included a helmet in their snow hire package was significantly higher among stores offering free loan helmets, with follow-up surveys suggesting that consumers who received a free loan helmet went on to use them while skiing or snowboarding. More generally, the percentage of skiers and snowboarders who were observed to be wearing helmets at Colorado ski resorts increased significantly over the four ski seasons that the program was conducted. Systematic reviews of the literature suggest that social marketing campaigns are an efficacious method of encouraging health-related behaviour change.11 As sports medicine moves towards better implementation and dissemination of its evidence-based practice,12 there will consequently be a need to make more use of this behaviour change approach. The challenge for the sports medicine discipline will be to determine how best to apply social marketing principles to the prevention of sporting injuries. Particular focus should be directed towards identifying how attractive exchanges can be achieved and on developing interventions that are truly consumer oriented.
. Incidence and risk factors of running-related injuries during preparation for a 4-mile recreational running event. Br J Sports Med 2010;44:598–604.
. Social marketing: its definition and domain. J Publ Pol Market 1994;13:108–14.
. Social marketing: an overview of approach and effects. Inj Prev 2006;12(Suppl 1):i38–43.
. Social marketing's mythunderstandings. J Social Marketing 2011;1:8–16.
. Social marketing in public health. Annu Rev Public Health 2005;26:319–39.
. Safety attitudes and beliefs of junior Australian football players. Inj Prev 2002;8:151–4.
. Marketing Social Change: Changing Behavior to Promote Health, Social Development, and the Environment. San Francisco, California: Jossey-Bass 1995.
. Helmets for skiers and snowboarders: an injury prevention program. Health Promot Pract 2007;8:257–65.
. Helmet availability at skiing and snowboarding rental shops. a survey of Colorado ski resort rental practices. Am J Prev Med 2002;22:110–12.
. A systematic review of social marketing effectiveness. Health Educ 2007;107:126–91.